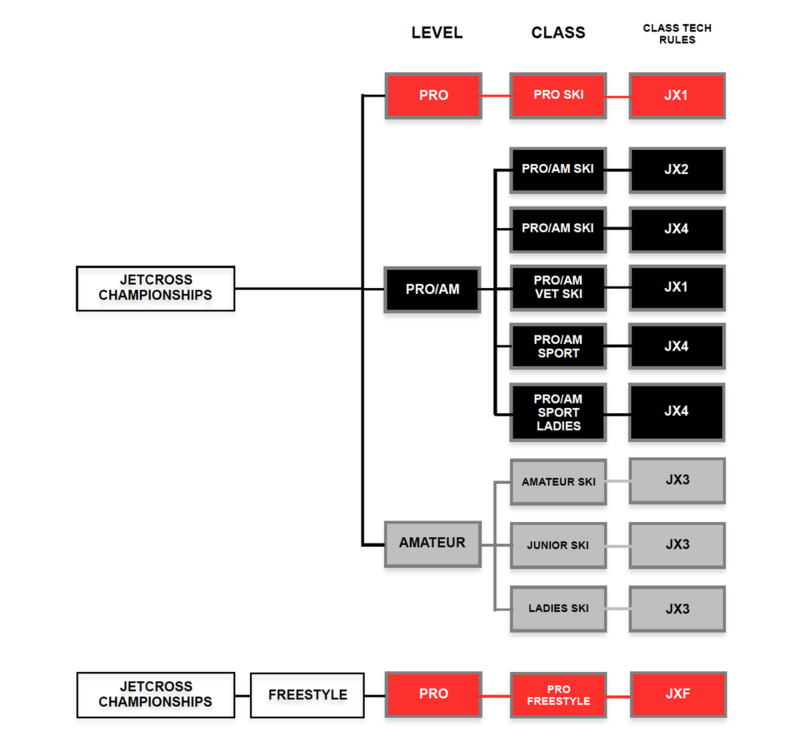 There is a Jetcross class for everybody, at all levels of skill and competence. From the best international professional skiers, to youngsters in their first year of the sport. Jetcross provides a platform for Ski and Sport type PWC. Jetcross racing will run to Jetcross general rules and technical rules – JX1-2-3-4. The Ski category will include Pro, Pro/Am and Amateur levels providing a natural stepping stone to the Pro class. The Sport class will include a Pro/Am Sport JX4 with Sea-Doo Spark and Yamaha EX & EXR model category to attract new racers. Initially, these two classes Sport – JX4 & Ladies JX4 may be merged, but as numbers increase they may be separated if Sport Ladies JX4 will get more than 10 pre-registered racers. Sport GP class is only available in the USA and may be merged with Sport JX4. For Kawasaki SX-R 1500 stand-up, due to its size and weight, this model will be in a unique class call Pro-Am Ski JX4, following SKI JX4 tech rules. The organigram below explains the structure for 2019. In the future we may add further categories, but in 2019 these are the options competitors can choose from.